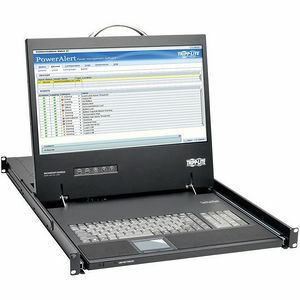 The B021-000-19-HD2 1U Rack-Mount Console combines a full keyboard, numeric keypad, touchpad and 19-inch color LCD for easy all-in-one control of a computer, server or KVM switch. Easy to install and simple to operate, it slides neatly into 1U of rack space when not in use. The rear DVI-I console port supports both digital and analog video signals for connecting to a DVI- or VGA-enabled server or KVM switch (a DVI to VGA adapter is included). The LCD screen supports video resolutions up to 1920 x 1080 (1080p). Video settings of the connected computer are automatically adjusted for optimal display on the LCD screen. USB 2.0 pass-through ports on the front and rear allow you to connect a USB peripheral, such as a flash drive or CAC card reader, to your computer with a USB cable (sold separately). The B021-000-19-HD2 mounts into 1U of space in an EIA-standard 19-inch rack using the included mounting brackets and user-supplied screws. Simply pull out the steel drawer and flip up the screen when needed, then slide it back into the rack in automatic sleep mode when you're finished. This keeps the keyboard and screen from blocking access to rack equipment when the console is not in use. This console is compatible with all major operating systems and KVM switches with a VGA or DVI monitor port and USB keyboard/mouse ports. This enables the B021-000-19-HD2 to be integrated into an existing system to provide secure management of critical network systems without a major investment in new hardware.